The Obama campaign’s theme of the week was doubling down on federal student loan subsidies. At a cost of $6 billion a year, they want to prevent rates from doubling from the current rate of 3.4% to a still heavily subsidized 6.8% under current law. While the media is all awash in uncovering lavish parties thrown by the GSA and the Secret Service, not enough scrutiny gets applied to the five year party that such behavior distorting prices are financing at our institutions of higher “learning.” Sold to the public as an investment, subsidized student loans finance consumption. Some training in knowledge our economy needs does take place, but these majors remain remarkably unpopular. Science, technology, engineering, and math (STEM) courses would go largely unfilled if our universities were not also engaging in a massive industry of education tourism where foreign students come to the United States to study the hard stuff while the Americans around them party. The universities get to charge the foreign students full tuition, but our immigration laws won’t let them work here. Lobbyists for our university industrial complex point to the critical knowledge that the 21st century economy needs without admitting how many of the few graduates who acquire it are then deported upon receiving their diploma. If we include all students foreign and domestic, total college enrollment has increased by 50% over the past 25 years but the number of students studying STEM subjects remains flat. In 2009 we graduated 37,994 computer science majors, a smaller cohort than the class of 1985! 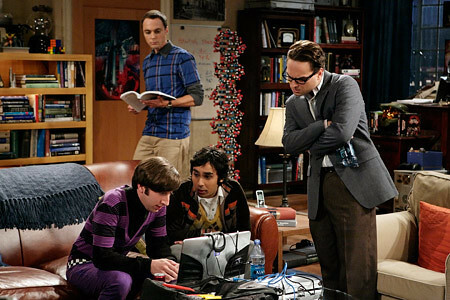 Our labor market does indeed reward the few legal residents that pursue STEM majors even if our culture socializes young people into stigmatizing such hard work as the purview of geeks and losers like the cast of Big Bang Theory. But how clear is the signaling mechanism of the labor market to college freshmen as they choose their majors? Young, overconfident undergraduates who pursue their college education with a sense of entitlement as to how much fun they are supposed to have in the “best years of their life” are prone to calculate a more short-term focus than the whole notion of “investing in higher education” implies. Take away the role of prices, and what should we expect? What 18 year old feels compelled to wrack his brain with organic chemistry, computer algorithms, and differential equations late into the night and all weekend long when for the same price he can skip all his assigned reading, show up for the exams, and BS his way to a BA in sociology? All things being equal, students prefer subjects where there are no wrong answers. The number of students graduating from American colleges and universities who had majored in the sciences declined from 1970-71 to 1984-85, both as a proportion of the steadily growing total and in absolute terms. Students make their course choices in response to a powerful set of incentives: grades. These incentives have been systematically distorted by the grade inflation of the past 25 years. As a consequence of this inflation, many universities have split into high- and low-grading departments. Economics, along with Chemistry and Math, tends to be low-grading. Art, English, Philosophy, Psychology, and Political Science tend to be high-grading. The two decades of research that followed has confirmed their work. Kevin Rask has measured the effects of grade inflation over this past decade while Philip Babcock and Mindy Marks have applied a tried and true “hours worked” econometric formula to undergraduate studies to measure how the amount of studying required to earn a degree has dropped as subsidies have increased. The effect of government subsidies on higher education has been to obscure the price signal that full tuition would otherwise have set. If students had to pay the full price for the cost of their education, they would make more rational decisions. The propensity to pay for things that do not enhance their marketability in the labor market would decline. The amount of students devoting four years of their lives to pursue a BA in art history or the like, only to join the ranks of the unskilled laborers upon graduation would once again be limited to the prerogative of the wealthy just like any other form of conspicuous consumption. Subsidizing the same opportunity for the children of the lower middle class actually limits their opportunity. When faced with the full cost of their education, scrutinizing costs with a focus on the actual return on their investment would become paramount. This is particularly true when choosing where to study. A remarkable amount of student debt comes from room and board even when a suitable university in their hometown would have allowed substantial savings from living at home and packing a lunch. It boggles the mind how many public dollars are spent subsidizing an expensive dorm lifestyle that distracts from learning rather than enhances it. If private lenders who want their money back rather than politicians who want votes were setting loan terms and interest rates, we would see a pricing mechanism in student loans that guided education dollars towards their more efficient use. Students entering fields that had better job prospects could enjoy lower rates, while students engaging in non-vocational studies would pay a risk premium. Lenders could also set terms based on grade inflation adjusted GPA. A 2.8 GPA in molecular biology at Reed College is not the same thing as a 2.8 GPA in outdoor adventure leadership at Southern Oregon State University. (Yes they offer a four year baccalaureate of science in such a challenging area of inquiry.) Lenders could charge lower rates or penalizing rates for graduates of various schools in response to actuarial data on the history of its alumni’s default rate. The advantages of saving a significant amount of federal tax dollars would be non-trivial, but the greatest economic advantages would come from the increase in STEM graduates and the increase in the labor supply as students who are not and never will be cut out for college no longer delay adulthood by avoiding the labor market for what is too often now five or more years. Our economy does not need college educated waiters, baristas, and security guards when we have been unable to fill our shortage of electricians, welders, and heavy equipment operators, skills that have been in high demand throughout this past recession as retiring baby boomers could not be replaced by high school grads in a country where increasingly only losers don’t go on to college. We now have an economy where liberal arts graduates, at great expense both to the public and themselves, are the real losers as employers naturally treat them like any other non-skilled workers. 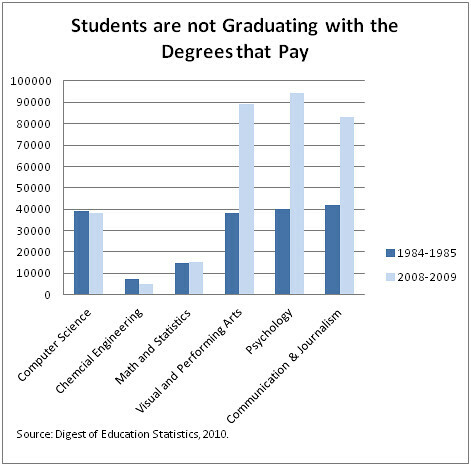 There was a time when a college degree in any subject correlated strongly with higher pay. We can still see some of this today if you massage the aggregate data enough, but it is largely a thing of the past. Employers have simply been looking for the smartest job-seekers in the population. Forty years ago, a college degree served as a filtering mechanism so that employers could find these people. By subsidizing greater access to higher education its signaling role has been diluted. This access has come in the form growing lower tiered institutions for lower tiered students. We can grow both the quantity and size of the Western Oregon States, Eastern Oregon States, and the like, but there will always be only one Princeton. At great public expense we have created an economy where finance majors at Portland State send their resumes to investment banks without any hope of getting a response but the same firms recruit on the campuses of Harvard and Yale, quickly signing up history and philosophy majors. Outside of the STEM fields, vocational training is easily done in house; finding smart college grads is hard. Because government financial aid is so focused on need rather than ability, it has been harming the prospects of the few bright kids that go to schools like PSU while making it difficult for employers to find them amongst the many classmates of theirs that never should have gone to college in the first place. Thus the greatest irony is that the more college graduates we produce the harder it is for employers to find the intelligent workers they are looking for. Is this not exactly what happened to the high school diploma? There was a time when it signaled the ability to read and write. The pressure to produce higher graduation rates lowered the standards to the point that college became the new high school. Now the college diploma is losing its ability to guarantee effective reading, writing, and math skills. Here is an easy experiment. Walk into PSU’s library downtown. Go over to the computer lab’s trash can and try to read the garbled prose of papers with 400 level course numbers on their title. It’s remarkable what you find. Will graduate school now become the new high school? At what point will we cease the wasted time and money pushing kids through more school with lower and lower standards, keeping them out of the work force in longer pursuits of ever expanding credential inflation? If we want education to be about training our workforce for the skills the 21st century will demand, we need to end the behavior distorting effects of subsidies. Allowing Stafford Student Loans to rise to a mere 6.8% APR is a good place to start. Eric Shierman lives in southwest Portland and is the author of A Brief History of Political Cultural Change, and also writes for The Oregonian’s My Oregon blog.